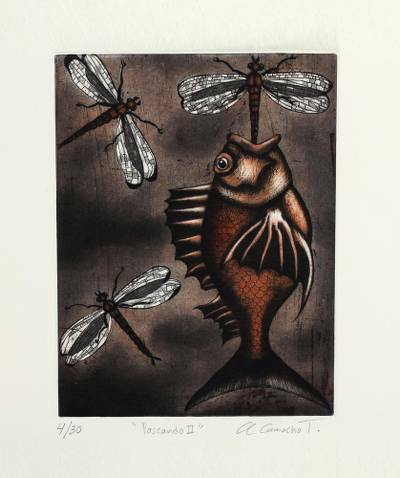 Surrealist Print of a Fish and Dragonflies from Mexico, "Fishing II"
Inspired by the beauty of nature, this impressive composition by Mexican artist Alejandro Camacho depicts a fish with a trio of dragonflies. One of the dragonflies emerges from the fish's mouth, a strange sort of birth. The artist works in a traditional printmaking style, diligently etching the design into resin to be applied with ink. The limited edition print arrives in a mat board passe-partout. Titled Pescando II in Spanish.